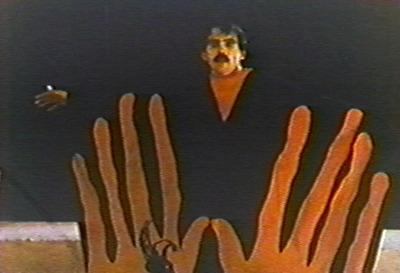 * I have never seen Manos before: after I tear my eyes out, I thankfully won't be able to. So I watched this without the Bots for the first time and I can say that I would have needed caffeine to get through this in a single sitting without interruptions. Maybe to go as far as A Clockwork Orange type device to get me to sit through it all in a single go. You may have no idea how relieved I was to read that! It was a tough go for me and just a tad disappointing. Haven't made it through the whole movie. It looks a lot like my vacation videos, complete with the accidental inclusion of the car window's side. Torgo is legitimately creepy tho. Interview with the little girl who played...Debbie? I don't remember. Her dad played the Master & was what you might call the film's scene designer; he designed the costumes, sets, & did the art. His wife made the costumes. To their credit, that costume the Master wears looks cool.